Would you like to add a credit card reader? The new upgraded SM23 standard configurations is as follows: 12 oz soda cans (QTY 3), 16.9 oz soda / water bottles (QTY 2), 20 oz sports drink - Gatorade, Powerade, etc. (QTY 1), 20 oz soda or water bottles (QTY 1). 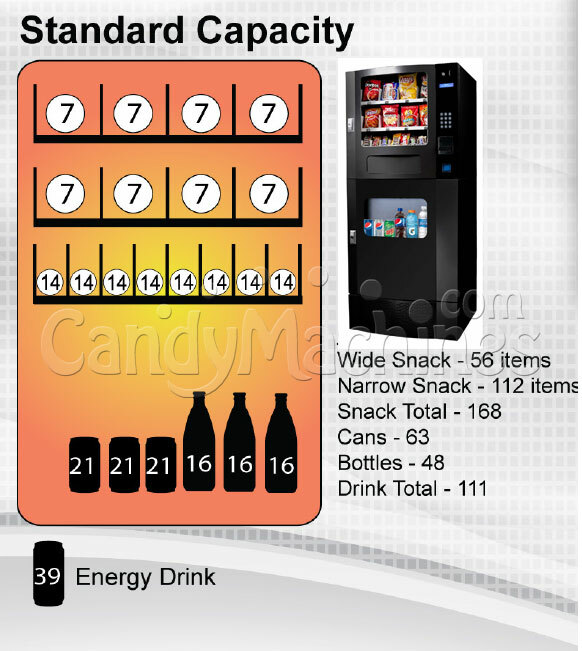 For custom items, you'll need to specify what you plan on vending. The SM23 also features a guaranteed delivery system. 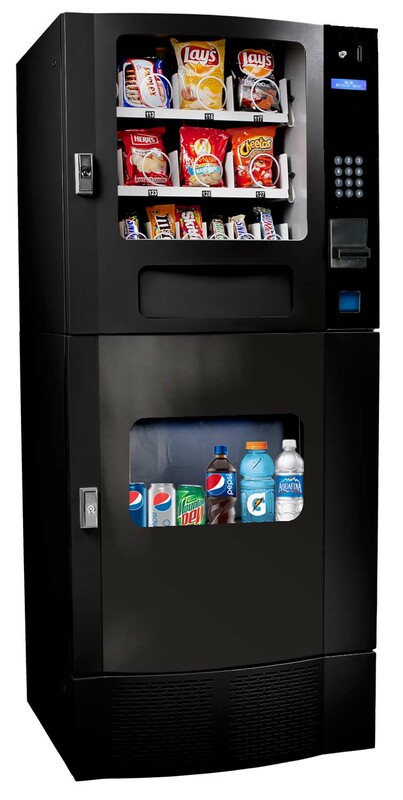 The Seaga SM23 Snack & Beverage Combo Vending Machine - This machine has taken a snack vending machine and combined it with a soda vending machine, giving customers a greater variety at break time. The top two trays are designed to feature wider products such as chips and pastries, while the third tray allows you to offer 8 different selections of confectioneries such as candy bars. The bottom half of the machine dispenses cold beverages. It is set to vend 3 selections of 12 oz. cans and 4 selections of 16.9 oz. or 20 oz. bottles. The payment mechanisms are found on the right side of the upper half of the machine and the components are installed on a vertical slide-out shelf, designed for easy access. Conversion kit available to vend small cans like Red Bull and other energy drinks. Each 12 oz can column has a capacity of 15 cans of soda (for a total of 45) and each bottle column will hold 10 bottles or water or similar bottled drinks. The main control board is now located on the back wall of the cabinet instead of the service tray to better protect the control board and harness. Seaga Manufacturing uses the ePort credit card reader by USA Technologies. USA Technology readers are swipe and mobile wallet ready and require a WIFI connection. 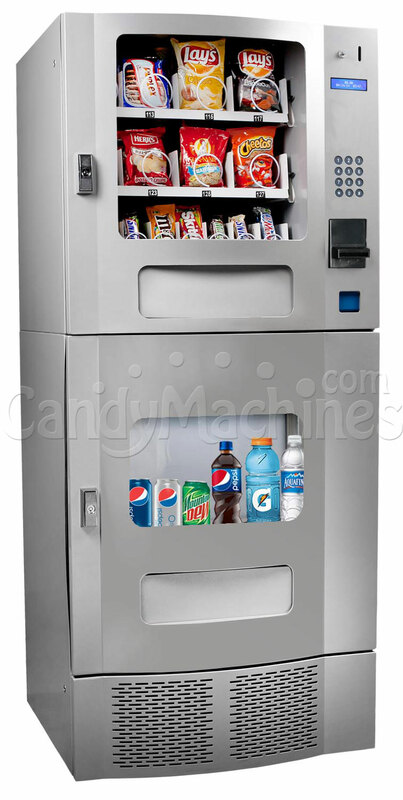 Additional model numbers this machine is known as: Seaga Snak Mart, Seaga SE-VC730, SG-VC730, CBC716, OD24, SM22, SM22S, SM22B, SC5200BCC, SC5200SCC, SM23. We have two of these machines (on in our shop and one in our waiting room) and they have held up well. I was a bit concerned about putting one in our shop, but have not had any issues. As a previous user mentioned, I wouldn't leave outside unattended but it's been great for our use. I was a bit hesitant adding the credit card reader because of the fees. We did have to raise some prices a little to cover the fees, but have been surprised by the number of people who pay with their phones with apple pay and samsung. I'd say the additional sales more than justify the small fees for having the credit card reader. Product is not as durable as expected. This machine was purchased for an unattended location, and not sure that it will be suitable. The clear plastic is very flimsy. The candy and soda sections are only connected with sheet metal screws. The theft guard protection is not sufficient to prevent theft. It's a good looking machine, but would not recommend for an unattended area.